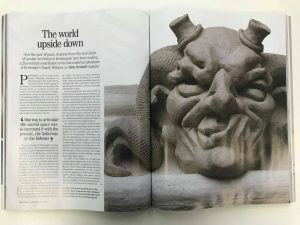 The Art School features in an impressive four page article ‘The world upside down’ in The Royal Wedding Collectors’ Issue of Country Life magazine. 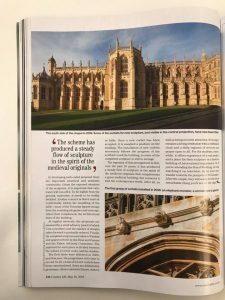 The article, showcasing a full-page, close-up image of a maquette of a grotesque featuring a horned demon greedily licking his lips, was written by John Goodall, Architectural Correspondent of Country Life and part of the Sculpture Group representing St. George’s Chapel, Windsor. The Sculpture Group select which three of our Historic Carving students’ grotesques will eventually adorn the external walls of the Chapel. 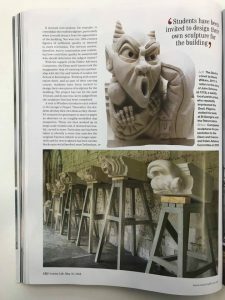 The collaboration with St. George’s Chapel, Windsor, started in 2005 and has involved an ongoing series of commissions for grotesques to replace eroded sculptures at the famous chapel that dates back to 1348. The eroded grotesques were Victorian replacements for earlier medieval carvings of unknown designs and the Dean and Chapter of St. George’s therefore agreed that new carvings could be commissioned from City & Guilds of London Art School Historic Carving students with the theme of ‘protecting the sacred space’. This has provided students with the chance to engage in the whole process of submitting works for commission, responding to a brief for a historic location, making work to a high professional standard that has to survive the weather and deliver on time. Each year three CGLAS students have been selected, based on drawings and maquettes, and to date students from both wood and stone carving courses have produced over 40 new carvings, many of which have already been sited on the outer walls of St. Georges’ Chapel. The Art School has been training stone and wood carvers since the mid-1940s when restoration courses were established to address the shortage of skilled professionals to repair historic buildings and monuments of war torn London. We still play a crucial role in keeping alive the skills essential for preserving the world’s most important monuments and buildings, and are proud to offer the UK’s only Diplomas and Postgraduate Diplomas in the subject. Click here for more information about our wood and stone carving Diplomas and Postgraduate Diploma. Places are still available for 2018/19 and bursaries are available to cover varying parts of the course fees.